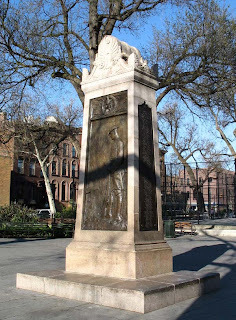 Brooklyn’s third oldest park is named for Charles Carroll (1737-1832), an American Revolutionary leader and signer of the Declaration of Independence, for whom Carroll Street is also named. The land for the park, laid out as private gardens in the late 1840s, was secured through an act of the New York State legislature in 1850, but was not built until 1867. The 1.874-acres park is one of the significant features of the neighborhood, occupying a city block bordered by Carroll, Court, President and Smith Streets. On September 10, 1993, after nearly a 20-year effort by local resident and elected official to upgrade the park, a newly refurbished park opened to the delight of neighborhood children. The $1.3 million park renovation was funded by Borough President Howard Golden and included reconfiguring two new play equipment areas – one for toddlers and another for older children, a children’s water spray in the form of a compass where distances are marked off to the North and South Poles and the Pacific and Atlantic Oceans. The historic character of the park was enhanced with decorative cast iron gates and fencing that echoes the fences of neighborhood brownstones. Another bocce ball court was built, and the park was completely re-landscaped and new parkscape elements were added including decorative lighting, World Fair benches, signature park hexagon pavers, and game tables. The bronze and granite of the Soldier and Sailors World War I Monument (1920), by sculptor Eugene H. Morahan, was conserved under the same project. A tall granite shaft, with four bronze plaques done by Eugene H. Morahan, is dated 1920, and stands in Carroll Park, President and Court Streets. It is dedicated to the memory of the men from the district who gave their lives in the War. 187 names are engraved on two side tablets. The front tablet represents a soldier in a cemetery, and the back, a sailor on the deck of a ship. Erected by the Eighth Assembly district memorial Committee, June 1921. It would appear that the homes on the right side of your photo of 1st place from Smith street are where P.S. 58 now stands. Is this correct? Were some of the houses torn down in order to build the subway station? Since the station is 4 tracks and 2 platforms wide, it would seem that much more width would have been required than would have been available solely from the existing Smith St. right-of-way. Also, is there history on the proposal, development, and construction of P.S. 58? I remember as a child the section of Smith Street between 2nd and 4th place on the west side of the street still had the original sidewalk from the homes that used to be there as well as some of the walks that would have led to the front doors. It wasn't until I was 11 or 12 that the current all-concrete configuration was done. I'm not in the city anymore, so I can't go to the L.I. Historical society or other libraries to dig through their microfilm and other documents.